Big summer thunderstorms are impressive to watch. However, they are also extremely dangerous. According to NOAA, lightning is the second deadliest type of weather in the US after floods. On average, it claims the lives of 49 people every year in this county and seriously injures even more. This year, to date, lightning has killed 16 people across nine states. Two were struck just this week. Sadly, this number will likely go up before the summer is over. Lightning comes in variety of forms, but the cloud to ground variety is the most threatening to us at the surface. A typical bolt carries a current of about 300 million volts and can heat the air around it to 50,000°F. That is five times hotter than the surface of the sun. 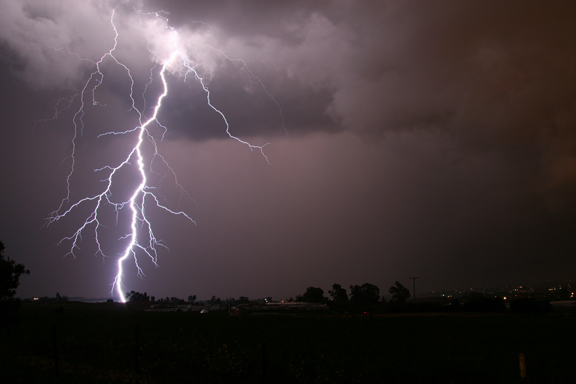 Around the globe, lightning hits the Earth about 100 times per second. In the US, the odds of a person being struck by lightning in any given year are 1 in 960,000 or 1 in 12,000 during an average lifetime of 80 years. A thunderstorm rolled through New York City yesterday afternoon. It brought the city 0.89 inches of rain and put on a spectacular light show. Below is a short video of the storm by Max Guiliani, a local New Yorker, which captures the dramatic moment when lightning struck the top of the World Trade Center in lower Manhattan. Thunderstorms can illuminate the sky with a number of different types of lightning. The most threatening to us at the surface, however, is the cloud to ground variety. Interestingly, it comes in two forms: positive and negative. While not completely understood, lightning – an intense electrical discharge – is believed to form as a result of the separation of charges in a cumulonimbus cloud. Within these towering clouds, both negatively charged hailstones and positively charged ice-crystals exist at the same time. As the storm’s updraft moves through the cloud, the lighter ice-crystals are carried upward, leaving the denser hailstones to fall to the bottom. As the negative charge builds at the base of the cloud, it induces a strong positive charge on the ground, especially in tall objects such as buildings and trees. When the charge separation becomes large enough, a negatively charged stepped leader, a channel of ionized air, initiates a lightning strike from the base of the cloud. Moving down toward the ground, it meets a channel of rising positive charges known as a streamer. When they connect, they form negative cloud to ground lightning (-CG), which is the most common type. Positively charged lightning (+CG), on the other hand, originates in the upper section or anvil of a cumulonimbus cloud. In this case, the descending stepped leader carries a positive charge and travels horizontally as it makes its way toward an area with negatively charged particles on the ground. It can travel more than 10 miles – a distance where thunder from the parent storm cannot be heard – to areas with relatively clear skies. For this reason, positive lightning is often called a “bolt from the blue”. It is most often associated with super cell thunderstorms and is considered rare. According to NOAA, it makes up less than 5% of all lightning strikes. While uncommon, positive lightning is extremely powerful. Originating at a higher level of a storm cloud, it has to travel through more air to reach the ground, intensifying its electrical field. Its peak charge can be 10 times greater than that of a negative strike. This immense power combined with a lack of warning makes positive cloud to ground lightning particularly dangerous. It is also believed to be responsible for a large percentage of wildfires. 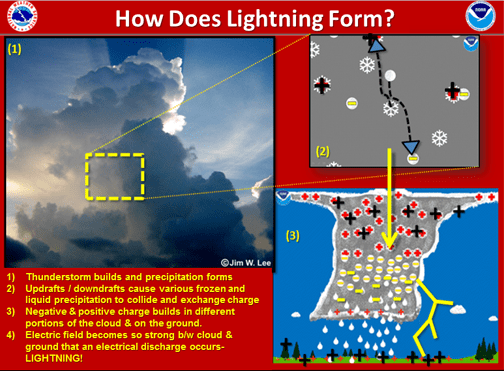 To visually identify positive and negative cloud to ground lightning, look at the shape of the bolt. Negative lightning will have a downward branching pattern and positive lightning will generally display a single bright stroke without branches. Regardless of these differences in charge and shape, it is important to remember that all lightning is dangerous. Stay safe! Summer is the season for thunderstorms and the lightning they produce can light up the sky in a variety of ways. Here is a quick look at the different types of lightning. Intra-Cloud: This is the most common type of lightning. It happens completely inside a single cloud, jumping between regions with different charges. It is sometimes called “sheet” lightning. Cloud to Cloud: This is lightning that occurs between two or more separate clouds. Cloud to Air: This type of lightning occurs when positive charges at the top of a cloud reach out to the negatively charged air around it. Cloud to Ground: This lightning occurs between the cloud and the ground. It can be either positively or negatively charged. When lightning flashes in the sky without a clap of thunder, it is called “heat lightning.” This, however, is a bit of a misnomer as it is not a special form of lightning and it is not generated by heat. In fact, it is just normal lightning that is too far away for the sound of thunder to be heard. 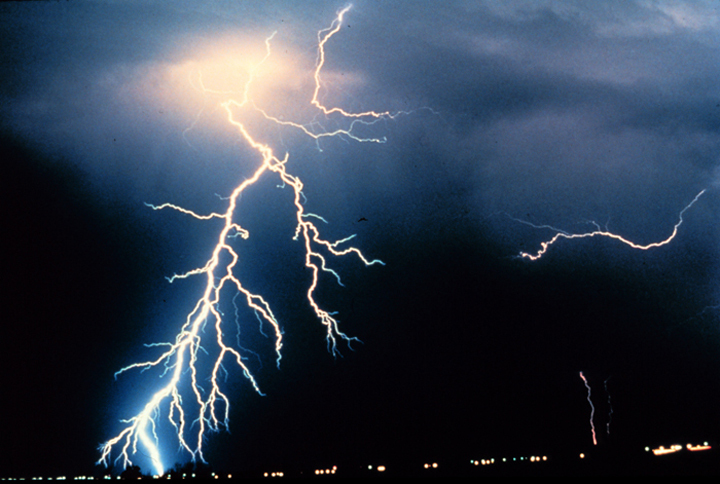 Lightning travels near the speed of light – 186,000 miles per second. Even at a distance of 10 miles, you will see it almost instantly. Thunder, on the other hand, travels at the speed of sound – about one mile in five seconds near the ground. It is often refracted through the atmosphere and reflected by the Earth’s surface, dissipating the sound. For this reason, thunder is rarely heard at a distance of more than 10 miles from where the lightning actually occurred. The origins of the term, “heat lightning”, are probably linked to the fact that it is most often seen on hot, humid summer nights. Flash! Bang! Thunderstorms are impressive displays of the power of nature. But how, you may wonder, do lightning and thunder form? First comes the lightning, an intense electrical discharge. While not completely understood, it is believed to form as a result of the separation of charges within a cumulonimbus cloud. One theory of how this happens involves the collision of particles within these towering clouds, including hailstones, super-cooled liquid water droplets, and ice crystals. When they mix and collide, according to NOAA, “electrons are sheared off the ascending particles and collect on the descending particles.” This results in a cloud with a negatively charged base and a positively charged top. As the atmosphere is a good insulator, generally inhibiting the flow of electricity, the strength of this electrical field has to build up substantially before lightning can occur. Most discharges, about 75%, occur across the electrical field within the storm cloud itself. This is known as intra-cloud lightning. Another electrical field can also develop below the cloud. Since the cloud base is negatively charged, it induces a positive charge on the ground below, especially in tall objects such as buildings and trees. When the charge separation becomes large enough, a negatively charged stepped leader – an invisible channel of ionized air, moves down from the base of the cloud. When it meets a channel of positive charges reaching up from the ground, known as a streamer, a visible flash of lightning can be seen. This is called cloud to ground lightning. Lightning can be as hot as 54,000°F, a temperature that is five times hotter than the surface of the sun. When it occurs, it heats the air around it in a fraction of a second, creating an acoustic shock wave. This is thunder. 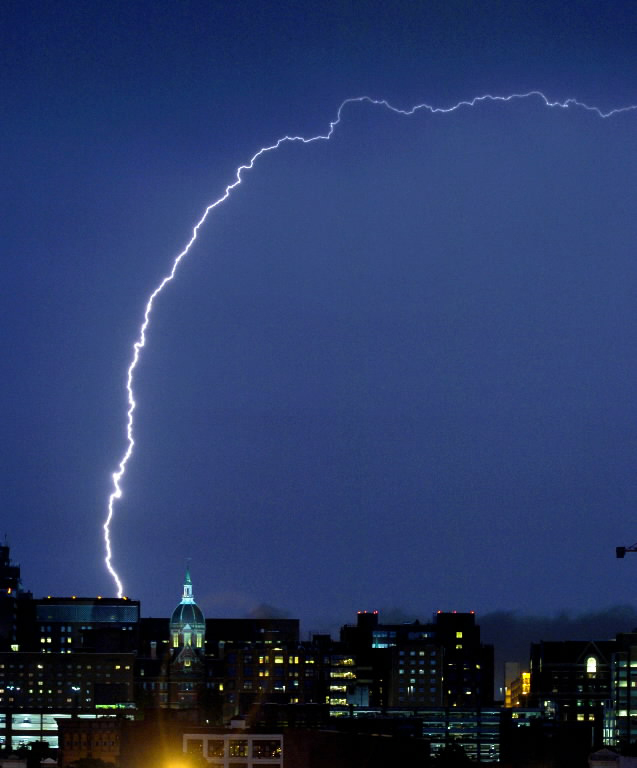 A nearby lightning strike will produce thunder that sounds like a sharp crack. Thunder from a distant storm will sound more like a continuous rumble. Lightning, nature’s most powerful static electrical shock, has sparked human curiosity throughout history. 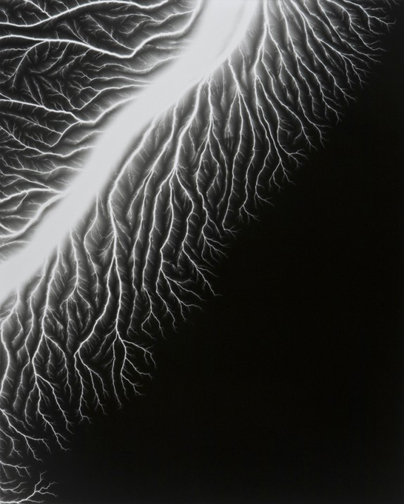 Recently, it helped to inspire the creation of “Lightning Fields”, a series of unique photographs by Hiroshi Sugimoto, a contemporary Japanese artist. To create this body of work, Sugimoto used a 400,000-volt Van de Graff generator to apply an electric shock directly to a large sheet of film. The resulting images show the flow of electricity with its tree-like branching discharges. The pattern of each image differs based on the strength of the charge and the path taken by the electrical current. The outlines produced in these experimental photographs are very similar to the Lichtenberg Figures that often appear on objects and people after they have been struck by lightning.